We are conveniently located in walking distance from the central area as Namba and Minami in Osaka. 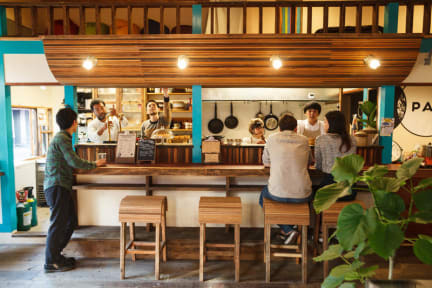 Access to Kansai International Airport is convenient as is traveling around Osaka using the JR line and Subway, which are all situated within walking distance. Around the PAX, there’re many restaurants, cafes, and souvenir shops on the Main Street. The hostel features a shared living area containing a loft with cafe and a records shop. Cafe is open on the first floor serving home roasted coffee and some meals. You can play the records you would like to listen. We invite you to relax in our building, enjoy a friendly, fun and intimate atmosphere, surf our top-of-the-range internet(Wi-Fi) and make yourself at home! *Luggage storage is available during reception open hours. *Earlier check-in is accepted after 8am if your bed has not been booked bed the day before. *Later check-in after 10pm is unfortunately not allowed. If you are arriving at Kansai International airport after 8:30pm, please book another place for the first night. *Upon being checked in you will be provided with a passcode that allows you to enter the hostel during anytime of the day and night. *Full payment needs to be made in Japanese Yen or with credit card, we accept VISA, MASTER,JCB,Diner's. *During the check-in process we require a electronic copy of a form of identification which will be kept within our secure system. *Guest rooms are located on the upper floor with NO elevator available therefore our staff will be happy to help carry your luggage if your require assistance. *Because of the building structure,rooms are not sound-proofed but free ear plugs are available. *Groups of 7+ people can not book our hostel. *Bed-sharing of adults is not accepted. Please book one bed per one person. *Bed-sharing for kids are welcome at only the private room. JPY1000 will be charged per 1 child if they are 3 years of age and older. One bed-sharing kid is acceptable per one adult. *Children under 7 years old are unfortunately not permitted to stay at dormitory rooms, and children 15 years and under should be accompanied with their guardians. 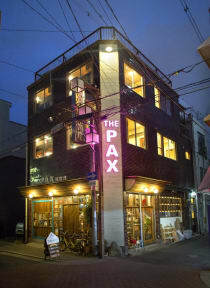 *THE PAX has been designed with independent travelers in mind thus our facilities are on a shared basis. We are a hostel and not a hotel or Japanese style inn (Ryokan). We are focused on providing you a fun, cheap way to travel and an opportunity to make new friends. #In the case of No show,all reservations will be automatically canceled, and the price of total nights will be charged. #Please keep in mind that this is a small scale facility, so all cancellations are significant to us. You will be charged under any circumstances(Ex: transportation delay/cancel, bad weather). *Rooms are designed to provide a warm and pleasant feeling different from regular hostels. *All beds are wooden pod style which have privacy with colorful walls and curtain. *Rooms - free Wi-Fi available / air conditioning / door auto-lock equipped. *Beds - private security lockers / bed lamp / 3 electric outlets / makeup mirror / hanger / ear plugs. *Bathroom is located in a separate room besides the dorm and is shared among guests.